Nischala Joy Devi’s interpretation of the yoga sutras offers a different take from most traditional translations. Devi set out to write a book that explicates the yoga sutras from a heart-centered, more “feminine” perspective. She realized that most of the existing translations of the sutras were written by men, and she noticed many of her female students commenting that the sutras didn’t seem to relate to them. Devi set out to complete a more accessible text for women. She sought for her book to embrace both thoughts and feelings (rather than separating thoughts from feelings, which is often done in Western culture). She generally uses the terms “consciousness” and “heart” where the customary translation would read “mind” and “thoughts”. Overall, I think Devi’s technique was effective.The first time I read the sutras was in this translation, and it was difficult for me; I’m not sure how I would have fared with a more traditional translation. At least with Devi’s version I felt as if the book was intended for ME. For the most part, Devi uses real life examples that made sense in relation to how to practice the sutras in a real woman’s busy life. On this reread, I was also simultaneously reading Sri Swami Satchidananda’s translation of the sutras; Satchidananda was Devi’s spiritual teacher, so it was very interesting to see where the two of them interpret the sutras differently and where they have a similar approach. In many instances, Satchidananda and Devi say much the same thing, but Devi couches her language in ways that feel more familiar and welcoming for a modern woman. Part of me wants to call this “the sutras – lite”, but it’s not light at all, it’s just a different take that… well, doesn’t feel quite so difficult, even though it’s the same material. Overall, I recommend this book for women who are looking to deepen the spiritual side of their yoga practice or meditation. I also recommend it for men who, like me, don’t connect so much with the mind/thoughts rhetoric in spiritual books. Hello… I am having so much fun browsing your blog. I discovered it because someone clicked from your blog to get to my blog.. (wordpress connecting us perhaps?). Anyway, I am also doing my teacher training and so many things you mention sound familiar. It is fun hearing someone else’s perspective. 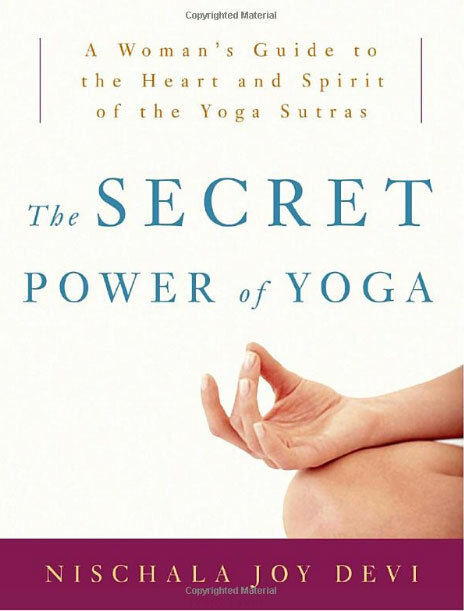 The Secret Power of Yoga book is one my yoga teacher brought to class and recommended. I keep meaning to buy it but find spare time limited since I started my training. We use the Satchidananda book in our class but I still think my favourite is Iyengar’s. It is a bit wordy at times though. Hi Julia! I found your blog in a similar way a couple months ago and liked it enough to link you on my sidebar, but it was definitely back before you started your teacher training–congrats! It sounds like your program is different from mine in terms of timeline, but we’re studying a lot of the same things and some of the same books. It’s a really interesting journey!